Time to Allow: 90 mins, minimum. All day is reccommended. Fees: Some state park and attractions charge fees. Driving Directions: The Silver Falls Tour Route begins and ends on Interstate 5. Southbound, take Exit 271 in Woodburn; northbound, take Exit 248 near Turner. Just follow the signs and enjoy. Rest from busy I-5 on this 55-mile side-loop. Majestic mountains (such as Mt. Hood) soar over lush green fields except in the forest areas; these areas are filled with Douglas Firs that sunlight can't quite part. 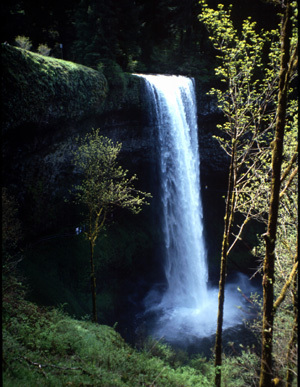 Silver Falls State Park is intimate in spite of the thunder of its waterfalls. Slow down to take in a peaceful countryside, rural towns that beam with Oregon history, shops, galleries, fresh fruit and flowers, and family festivals. Visit Oregon's largest winery, the Northwest's finest factory outlet stores, and a magnificent botanical garden. Oregon's oldest covered bridge is located 1.5 miles northwest of Silverton, and spans Abiqua Creek. It was built in 1917 and was recently restored. The bridge got its name during Prohibition when liquor was sold by the gallon in a nearby house. Juried art shows presented in 150-year-old farmhouse. One or more different artists are featured each month. Featured on the Woodburn Tour of Homes, this 1892 Queen Anne Victorian Home is the jewel of Woodburn's many historic structures. Owned by the French Prairie Historical Society.